The National Writing Project Produces Spectacular Results! 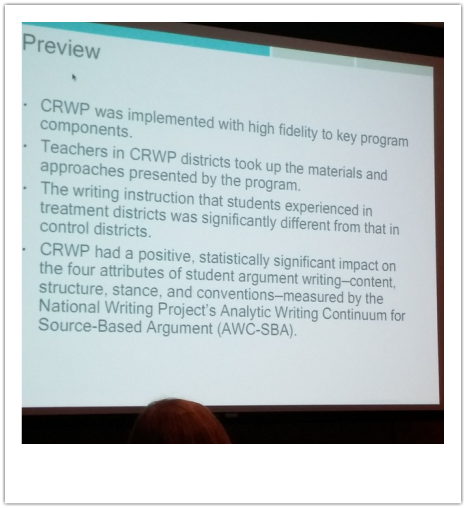 The College Ready Writers Program (CRWP), the same argument writing process utilized in KWP's Rural Schools Professional Development Initiative, has been proven to significantly impact student growth in writing AND teacher practice. These recently-released results are based on a nationwide study conducted by the National Writing Project. ​Year two work in Kentucky promises to be just as productive, so be sure to check the website, as well as our Facebook and Twitter feeds for upcoming professional development offerings. ZOOM IN! is an exciting new resource for American History teachers (grades 5, 8, and 11 in Kentucky) who are interested in engaging students with primary & secondary sources through an online platform that provides a high level of support for students in reading, analyzing, and writing about texts. Sessions will be provided at our Fall Conference on Schoolwide Literacy (Richmond, Sept. 17) and at the Louisville Writing Project Fall Mini-Conference (Aug. 27). KWP has been working with EDC to promote the opportunity for about a year. In November, several representatives from our state network met with Bill Tally and Noah Goodman, the developers of Zoom In. That led to summer workshops in Richmond and Louisville that introduced the tools to about 50 Kentucky teachers. ​Join us and see what all the excitement is about? On behalf of the Kentucky Writing Project State Network, we would like to thank all our presenters and those who helped make our annual fall conference a success. We also appreciate the responsiveness and sharing from the participants in each session. The Kentucky Writing Project has been busy! Below is a sideshow of our recent working weekend at Blue Lick's State Park. We hosted five workshops around the state on College-, Career- and Community-Ready Writing (3CR) Argument Writing this summer and will host sessions at our Fall Conference on Schoolwide Literacy (Sept. 17 in Richmond) and at the Louisville Writing Project Fall Mini-Conference (Aug. 27 in Louisville). Join us! Would you help us spread the word about a fabulous early childhood opportunity? Please share the information below! The Kentucky Writing Project had an extremely productive summer! 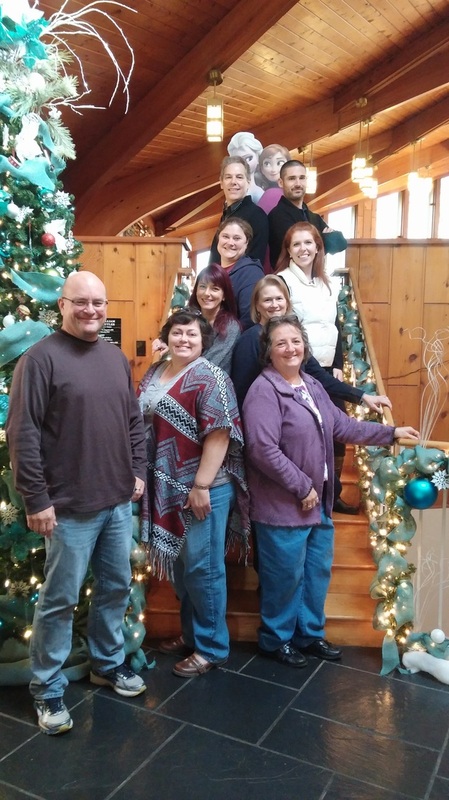 Other than the professional development offerings we provided, we were honored to work with over a dozen rural schools to provide three days of high quality in-service. 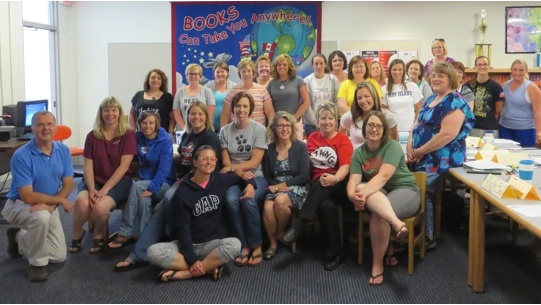 Recently, we were graciously hosted by Northern Elementary in Pendleton County, Kentucky. We would like to thank Northern Elementary (with facilitators Angel Peavler and Harold Woodall), as well as all the other districts involved. Your commitment to professional learning will reap tremendous benefit in your classrooms! Joseph Harris, author of Rewriting: How To Do Things With Texts, is one of the many research-based sources informing the work of the Kentucky Writing Project. 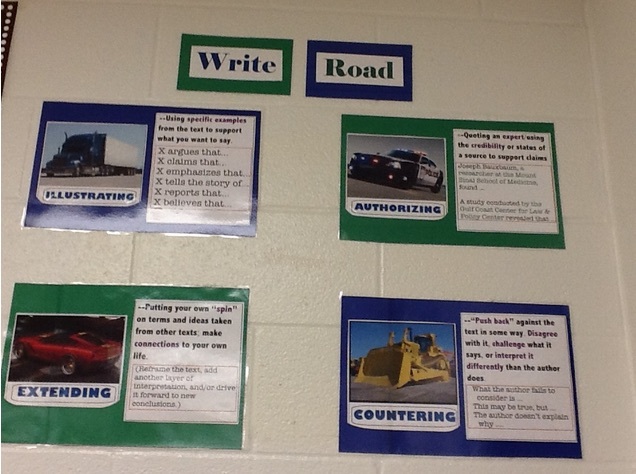 This picture, displaying one of Harris' strategies for writing arguments, is from Tasha Bowlin's Jessamine County classroom.